RFID-sirun: Mifare 1K S50, Mifare S70 4K, Mifare Ultralight10, Mifare UltralightC, I CODE SLI / SLI-S / SLI-L / SLIX, Mifare Desfire2K / 4k / 8K, Mifare PLUS2K / 4K, Ti2048, EM4200, EM4305, EM4450, EM4102, TK4100, T5557, T5577, CET5500, Hitagl, Hitag2, Hitags, FMl208(prosessori), Alien H3, Impinj M5, jne. 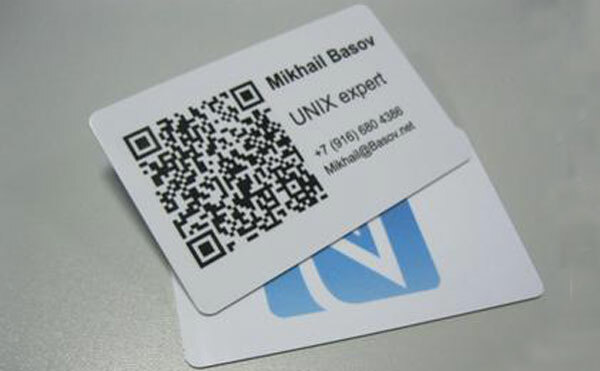 QR Code is often used as an element of plastic cards, adding card features such as product information or personal information, company websites, jne. for easy reading. Barcode cards can also be packaged chips made of RFID cards. Also in the card surface hot laser silver or laser gold, plus magnetic stripe, jne., to add more features. Barcode card is divided into two kinds of One-dimensional code and QR code. One-dimension code is commonly used, such as daily commodity barcode on the outer packing is One-dimensional code. Its information storage capacity is small, can store only a code, when using through this code to taken data in a computer network. QR code is developed in recent years, it can in the limited space to store more information, including text, images, sormenjäljet, signature, jne., and can used break away the computer. (3) limitetty 2 of 5 Koodi: a variable length of continuous self checking system of digital Code. (4) Koodi 39 (Koodi 3 of 9): length variable discrete self checking letters word type Code system. (6) Koodi 128: a variable length of continuous alphanumeric code system. (8) Other Code: Koodi 93, Koodi 49, Koodi 2 of 5, 11 koodi, Matrix 2 of 5 koodi.